Now that everyone has an Android or iPhone in their pocket, there's no excuse for being late to an appointment or job interview. Thanks to that GPS receiver in your smartphone, navigating your way through city streets and highways is a cinch, in or outside of your vehicle. But once you get inside a building, that fancy GPS feature doesn't know what to do. Which direction is the elevator? How do you get to room 819? Where's the nearest fire exit? The bathroom? But coming soon to a smartphone near you is a navigation system for buildings! Researchers from Fraunhofer, along with other partners, have engineered a clever combination of sensors into a tiny module that tracks the movements and position of its user in precise detail. This module could be plugged into (or directly imbedded into) your Android or iPhone to help track your location in the building. Since the sensor module works autonomously, it does not have to rely on the computer capacity of the smartphone's built-in processor. It uses its own small processor that needs substantially less power. That relieves the device's battery. There are similar technologies out there, but the "MST-Smartsense" sensor will be able to track your steps and strides unlike any pedometer today. Of course, building maps will have to be available for you to navigate your way indoors. 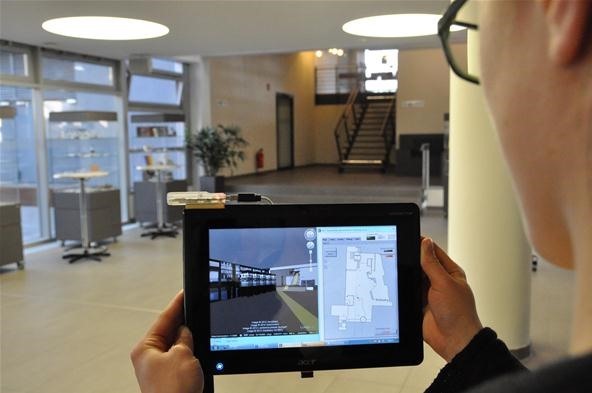 For this purpose, when you enter a building, a 3D map of the building will be automatically downloaded to your device. These are coupled with the sensor module to display a user's current position on the smartphone. Even more: the ideal walk route also appears on the display. Building plans can also be fed automatically to the cellular device as soon as you enter a building. It would also be possible to apply a two-dimensional QR code on the layout plan at the entrance of the building. Users could then scan the code with their smartphone, to download the corresponding map. If these things would fit in my iPhone, it'd be interesting to see just how useful this could be. Could be good for navigating shopping malls and complex structures. But do you really need to see a map of the inside of a building? Or better yet, who's going to give up detailed 3D maps of these buildings? I can think of more than a few reasons why they wouldn't.